Take a good look at that picture. Let it burn onto your consciousness. 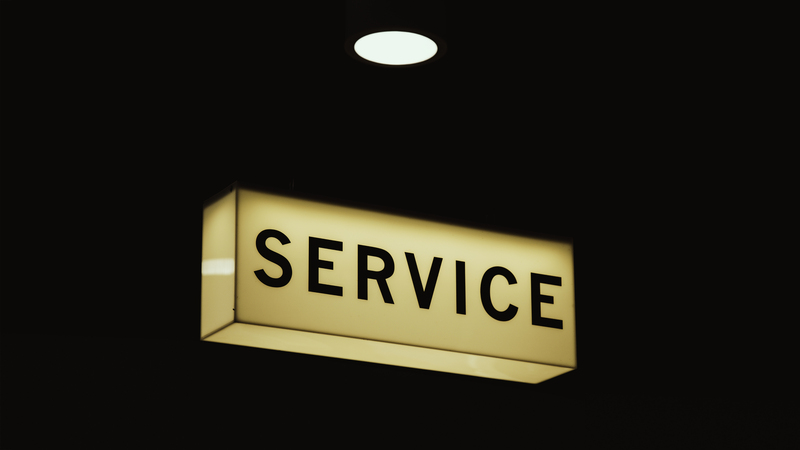 Service is all you have to actually differentiate yourself. When anyone can provide what you provide, do what you do, be what you want to be, your focus on service is all that matters. How does an individual compete against a huge, well-entrenched company? By providing better service. Being more responsive, more flexible, and more personally accountable. How does a huge, well-entrenched company compete against the scrappy upstart individual? By providing better service. Being more responsive, more flexible, and more personally accountable. Who has the advantage in this battle to provide the best service? The one that actually lives a service-first mindset. The one that considers the customer’s perspective before their own. The one that delivers excellent service…every time. The one who knows that no company can survive or thrive if it forgets about creating an excellent experience for their customer. Customers always have an alternative. If your organization isn’t committed to making their experience an excellent one, they’ll figure it out quickly and choose an alternative. It’s that simple. It all comes down to execution, which comes from your uncompromising mindset toward service excellence. Service is your only advantage. It’s the same advantage everyone else has if they choose to execute on it. This entry was posted in Attention, Attitude, Awesomeness, Customer Experience, Customers, Excellence, Focus, Leadership, Listening, Ownership, Perspective, Priorities, Winning, Zombies and tagged Execution, Service, Service Excellence on October 24, 2016 by Bob Dailey.